Last week, the State Education Department also announced that they plan to upload sensitive, personal student data to inBloom, starting in July. New York is the only state of the nine original inBloom participants not to pull out completely or put their data sharing plans on indefinite hold. In recent weeks, Legislators had the opportunity to interview both new applicants and the incumbent candidates for the four open positions on the Board of Regents. “It is inconceivable to think that Legislators would vote for an incumbent simply out of deference to his or her previous service. I watched the interviews, I read the Regents Taskforce Report. I know that the Regents Cea, Cottrell, Jackson, and Norwood are not the best candidates for the job and do not deserve to be re-appointed. 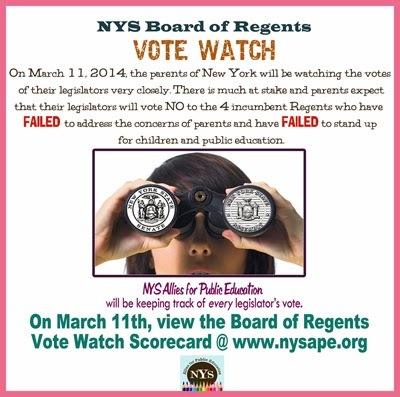 The future of public education in this state hangs in the balance and this vote will help influence how thousands of parents in turn cast their votes come November,” said Bianca Tanis, parent and co-founding member of NYSAPE.